Soldiers' Angels - MWD's Love Care Packages Too! MWD's Love Care Packages Too! Our deployed service members are not the only ones that work hard to protect us-- Military Working Dogs (or MWD's) do too! There are more than 2,500 Military Working Dogs in the US Armed Forces and, at any given time, hundreds of those four-legged heroes are deployed with their handlers. Angel Lisa, a member of the Soldiers' Angels Deployed Adoptions Team, has an adopted service member that just so happens to be one of those handlers. 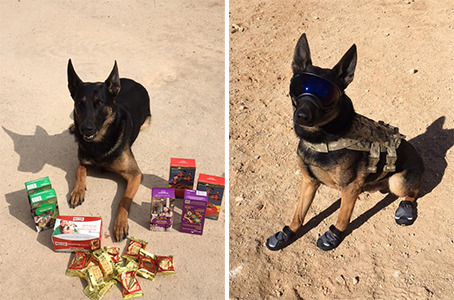 When she sends care packages to her service member, she also includes extra special treats for this adorable pup! He is pictured with Milk Bones dog biscuits, Girl Scout Cookies, and Grab the Gold treats (the last two are, of course, for his handler! ).